Dry freight overhead roller shutter door spare parts to suit commercial vehicle dry freight,refrigeration doors including:- dry freight cables, dry freight cable drums & winding plugs, dry freight hinges & holders, dry freight locks & keepers, dry freight pullstraps & handles, dry freight rollers & bearings, dry freight springs & spring assemblys, dry freight side/top/bottom seals and dry freight wooden panels. Dry freight wooden panels are cut to customer specification on widths up to 2400mm wide. We then cut and route panel to 3 following designs : dry freight finger sheild, dry freight super slat or dry freight tongue & groove. All dry freight products we supply are manufactured to the highest standards and have been supplied into the dry freight market for many years with a proven track record of reliability and value for money. 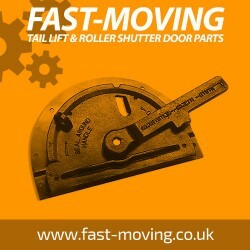 If you are looking for dry freight products at a competitive price then FAST-MOVING.co.uk is the supplier for you. Fleet Engineer replacement dry freight parts are suitable as some replacement components of many door types including : Dry freight, Coldsaver, JR Industries, Whiting doors, Mobile doors, Henderson doors, Todco doors and Boyriven FIT doors. Dry freight roll up door galvanised cable. 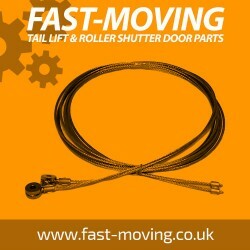 Our replacement galvanised roller shutter door cab..
Dry freight roll up door stainless steel cable. Our replacement stainless steel rol..
Dry freight roll up door hinge. These hinges are made from mild steel and are silver in apper..
Dry freight roll up door metal hinge. 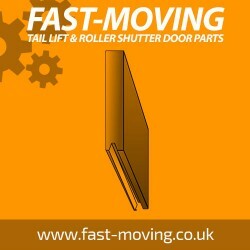 These hinges are made from mild steel, then powder coat..
Dry freight roll up door plastic hinge. 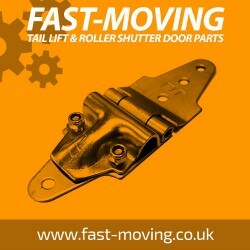 These hinges are made from a high strength nylon and ..
Dry freight roll up anti-lozenge hinge/bracket. 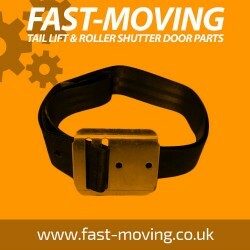 These hinges are made from stainless ste..
Dry freight roll up door pull strap. These pull straps are used on all dry freight ..
Dry freight roll up door lift handle. 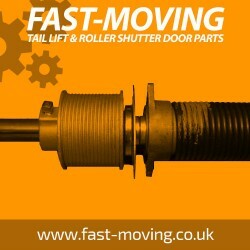 These handles are used on all dry freight&nbs..
Dry freight roll up door nylon track rollers. 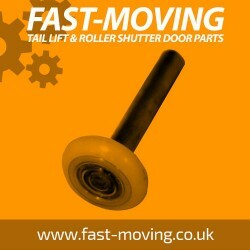 These nylon track rollers are us..
Dry freight roll up door steel track roller. These steel track rollers are used on all d..
Dry freight roll up door inner bearing. These bearings are found on dry freight overhead spri..
Dry freight roll up door outer bearing. These bearings are found on dry freight ove..
Dry freight roll up door spring. These springs are used on all dry freight overhead roll..
Dry freight roll up door single spring balancer. These spring balancer assemblys ar..
Dry freight roll up door dual spring balancer. These dual spring balancers are used to contro..